Last week was a very productive week. I am starting to see the light at the end of the tunnel. 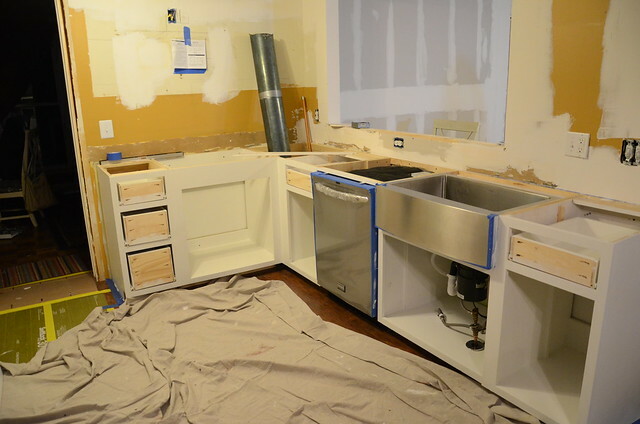 We still have lots of work to do, but the countertops are going in today. 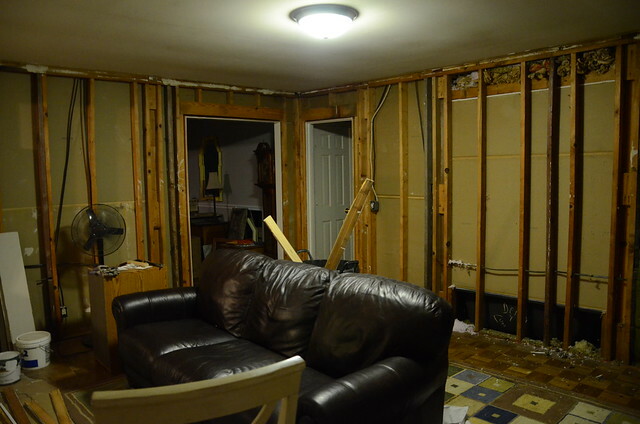 So hopefully (fingers crossed) I will have a useable kitchen by the end of the day. I will share photos of my new countertop tomorrow. Here's some progress photos from the week. 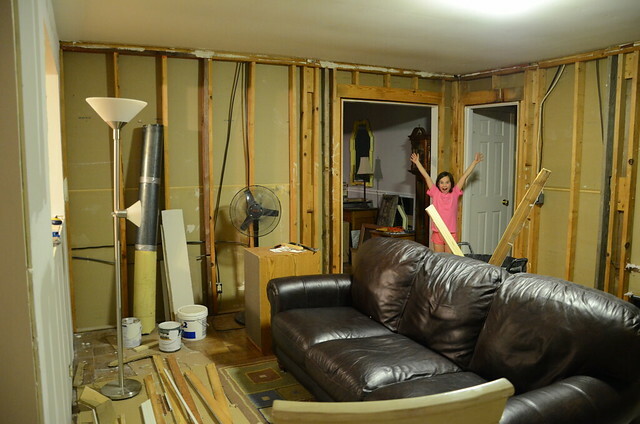 The paneling was removed from the room adjoining the kitchen. 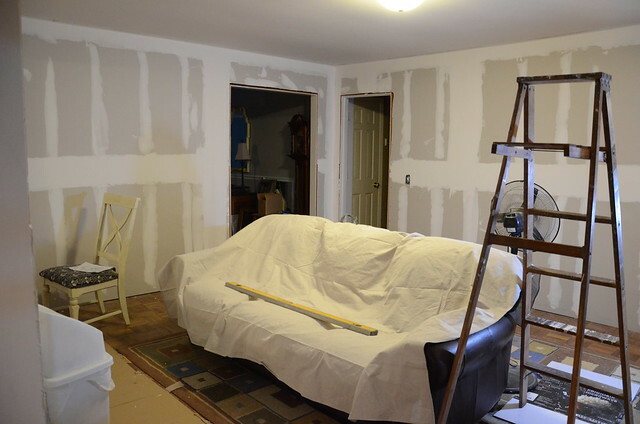 The next day Mitch and our contractor drywalled the room. Ahhh, much better. 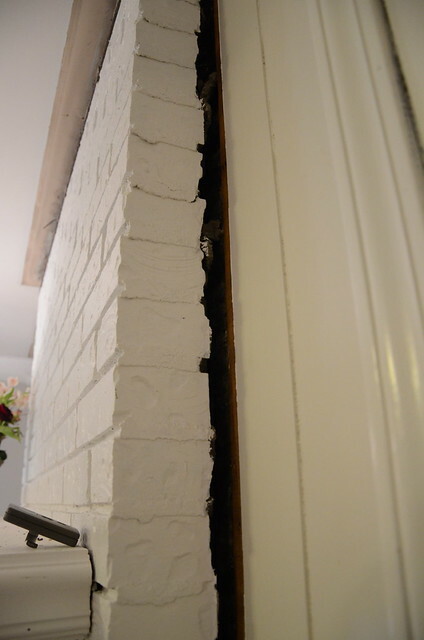 When Mitch took the molding off around the fireplace, we discovered that the fireplace is pulling away from the wall. Nice, huh? We have a mason coming out on Friday to look at it and tell us what he thinks we should do. More than likely it is going to have to come down. Our contractor made all the doors for our cabinets last week. Mitch sanded them and I put a coat of primer on them . It's starting to look like a real kitchen. 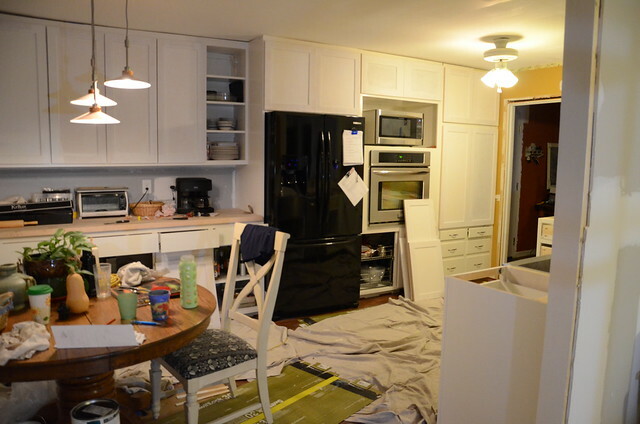 I primed and put one coat of paint on these cabinets. 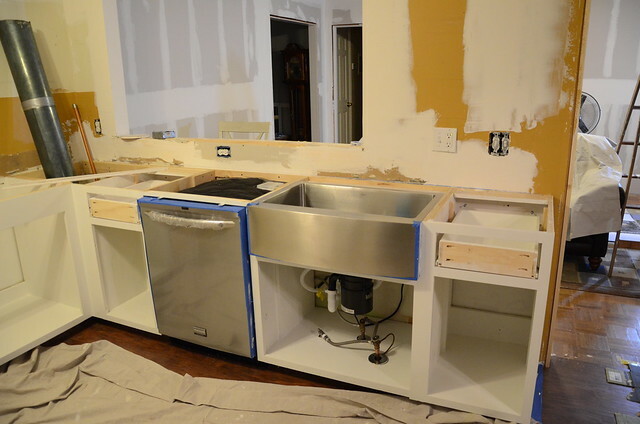 Our contractor installed the dishwasher and sink, so the faucet is all ready to be hooked up once the countertops are installed. The plan is to tile the backsplash next weekend. 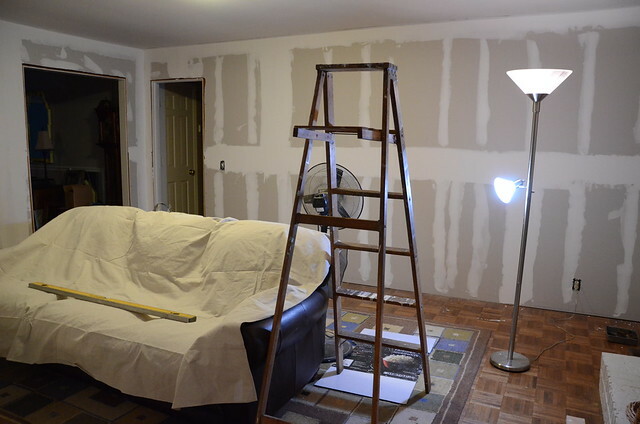 We also need to sand all the drywall and prime the ceiling and walls. 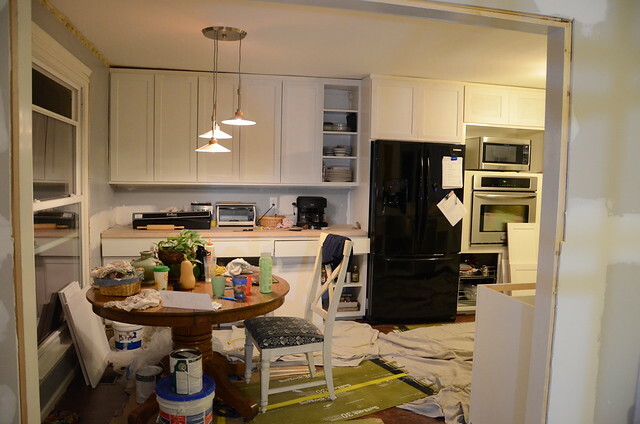 Then paint all the cabinets doors, plus all kinds of little things. 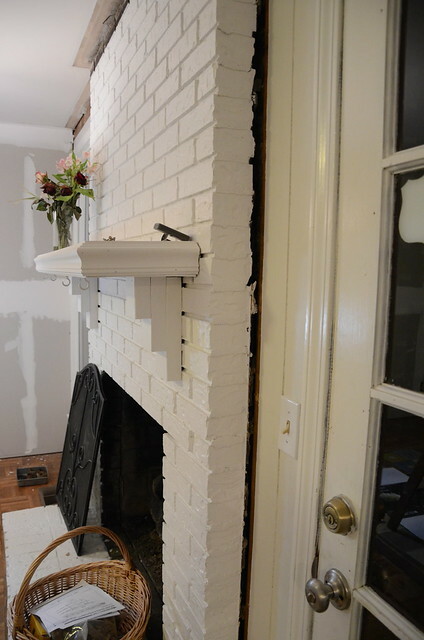 Once the tile is up, the contractor will come back to install the hood and put up the trim around the room. We are slowly but surely getting there. And I also discovered countless status updates.